It has been a chaotic week in Queensland with 1 in 100 year rains in the north affecting shipments out of Abbot Point which we have continuously reported on this week. At this stage there is no end in sight for this rain. In addition to this we have had industrial action throughout the week (overtime bans for workers) on the Central Queensland Coal Network resulting in a number of cancelled rail services across the network affecting coal deliveries to major Queensland coal terminals. Next week, more of the same in terms of rain is forecast as per below 4 day rain forecast for the region. 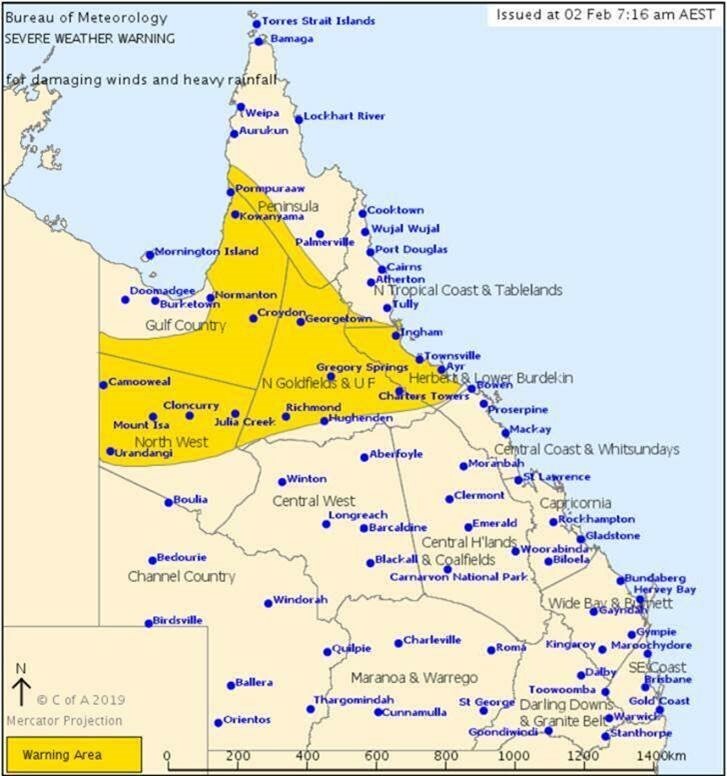 Following is the latest severe weather warning area for northern Queensland. Heavy rainfall is likely within the warning area during today. Six-hourly rainfall totals between 150mm to 200mm are likely with isolated heavier falls possible, particularly with bands of thunderstorms. Creek and river catchments are already saturated and will therefore respond very rapidly to any rainfall. Flash flooding is a high risk. Landslides have been reported associated with this event and will continue to be possible in vulnerable areas that have experienced significant rainfall. 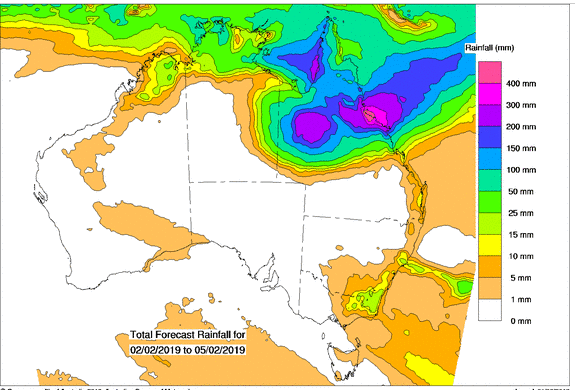 The monsoon trough is expected to remain active into next week, with further heavy rainfall expected for already saturated catchments between about Innisfail and Bowen. The potential for significant and dangerous flash flooding will likely continue into next week. Maintenance workers at these depots will also stop work for 24 hours on 06 & 07 February, respectively. Callemondah, Stanwell and Bluff depots will stop work for 24 hours from 10am on 06 February (Blackwater system – RG TANNA & WICET). The blackwater is also down for scheduled maintenance 0700/04 February to 0700/06 February. Berth 1 at BMA’s Hay Point Terminal has gone down for maintenance yesterday and will be out of action until 10 February. At Abbot Point, in addition to current weather related issues, Ship-loader 1 is due for scheduled maintenance for 12 hours from 0630hrs on 05 February and again from 0700hrs on 12 February. Ship-loader 2 will also be down for 12 hour maintenance spells from 0630hrs on 04 February and again from 0630hrs on 09 February. DBCT is also subject to major maintenance later in February with both berths 3&4 expected to be out of action from mid-February until early March. Berth 1 will be subject to a 5 day shutdown thereafter. 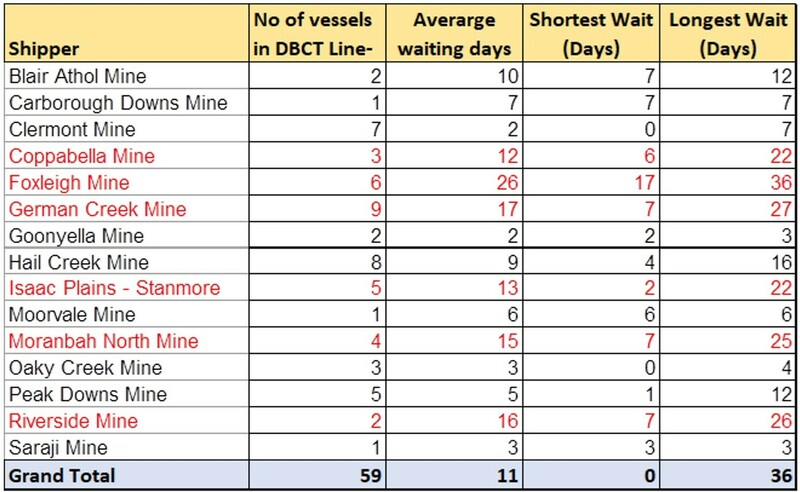 While the DBCT queue continues to drop and average waiting days also maintain a healthy level there are clearly a number of shippers that are unable to get cargo to the port as quick as others due either railing or cargo availability issues. Following is an analysis of the current DBCT line-up. We trust you will find value in this brief and please do not hesitate to contact me should you have any questions.